ITW Military Grimloc is a locking D-Ring for additional gear storage and easy attachment. 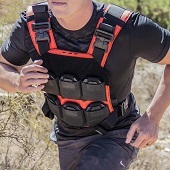 The Grimloc can be attached to a variety of gear and directly to webbing on your plate carrier, backpack, or pouches. Grimlocs can also be used to route slings, hydration tubes, antennas and more. Lightweight and durable construction, the ITW Grimloc features a debris channel in the locking mechanism to prevent lock-up and still function is dirty environments. The key feature is that the Grimloc easily opens with a via button on the top of the D-ring.